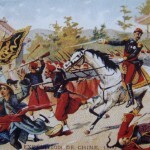 Foreign imperialism in China was a critical cause of revolutionary sentiment. European interest in dates back to Marco Polo, the Venetian explorer who completed two expeditions to China in the late 1200s and published a widely read account of his voyages. The Age of Exploration in the 16th century produced an increase in Western expeditions into Asia. Over the next three centuries Britain, France, Spain, Holland and Portugal all established colonies and trade links in Asia. Of these five imperial powers, the British were comparative latecomers to Asia, conquering India, Penang, Singapore, Burma and other territories by the late 1700s. By the mid-19th century even Japan, previously an island closed to foreigners, had succumbed to Western pressure. The outcome of Japan opening its doors was a rapid transformation from feudalism to modern industry. The encroachment of Western powers into Asia had a profound impact on China. With its manufacturing economy, natural resources and enormous population, the Middle Kingdom was a rich prize for Western capitalists. 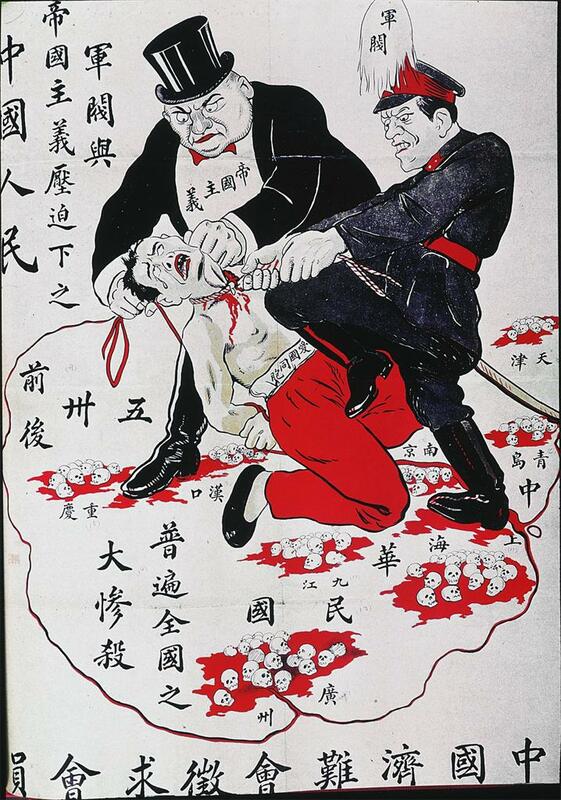 But the actions of foreign imperialists in China also undermined the weakening Qing regime. Among first foreigners to arrive in China were Christian missionaries. Franciscan monks travelled there in the 13th century, followed by a wave of Jesuits in the 16th century. One of these Jesuit missionaries, Johann Adam Schall von Bell, became an influential advisor to the first Qing emperor. Others travelled around China, preaching and converting Chinese to Christianity, a process that aggravated imperial rulers and occasionally prompted bans on Christian activity. The first steps toward economic imperialism in China date from the mid-1500s, when Portuguese traders paid for access to ports in Macau on China’s far south-east coast. In 1711 the British East India Company also established a trading post there. Over the next few decades, the Qing leadership tried to restrict foreign trade to Macau and the surrounding region, though their efforts were largely in vain. In 1757 the Qing introduced the canton system, requiring foreign companies to trade with a Chinese merchant collective – not directly with the Chinese people. These attempts to limit and control foreign trade activity failed and it began to spread beyond the south-east. The British soon became China’s largest foreign trading partner. British companies purchased vast amounts of Chinese tea, as well as luxuries like silks, porcelain and other decorative items. Wealthy Chinese were also avid consumers of British-made gold, silver and jewellery. Toward the end of the 18th century, British ships began importing a more controversial item into China. Opium is an addictive narcotic, extracted from the poppy flower and usually taken through smoking. Opium was used in China as early as the 15th century – however opium smoking was largely restricted to the privileged classes. British ships began landing supplies of opium in China in the late 1700s and early 1800s, mainly around the mouth of the Pearl River in Guangdong. Opium became more available and more affordable to all levels of Chinese society, even the working classes. 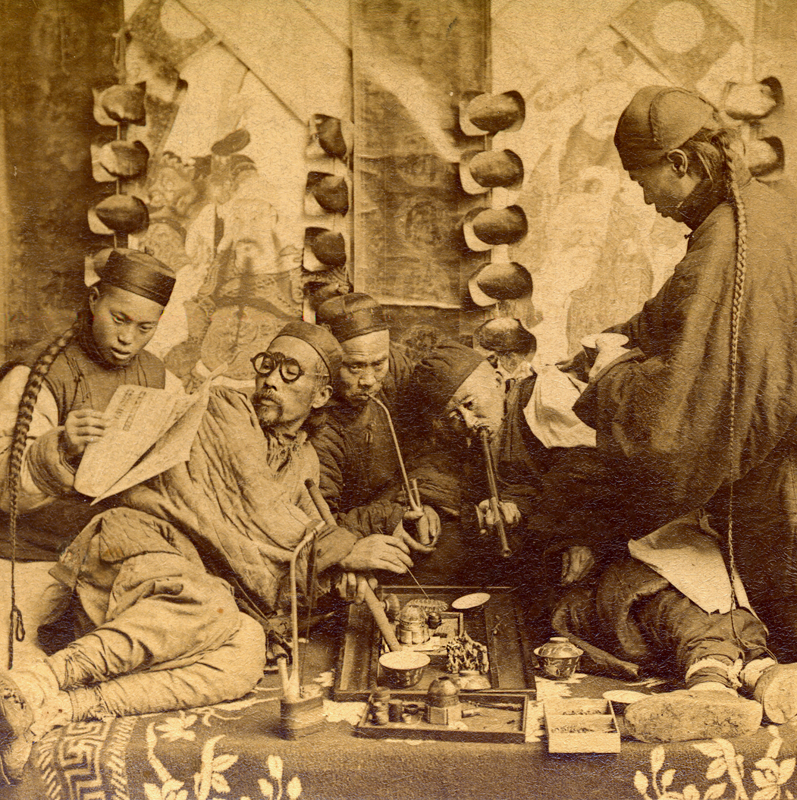 Once the hobby of emperors and rich men, opium smoking soon flourished. Chinese towns and cities had numerous ‘opium dens’, where thousands of men lingered and spent their days in a drug-induced stupor. The Qing government understood the social and economic dangers posed by opium. Beijing attempted to ban its use and importation several times, but these restrictions were difficult to enforce and the British generally ignored them. In 1838 a Qing commissioner seized and destroyed 20,000 cases of British-imported opium, a move that triggered the First Opium War (1839-1842). Though Qing forces heavily outnumbered the British, they lacked Britain’s naval strength and artillery firepower, so were comprehensively defeated. This defeat resulted in a humiliating treaty. The Qing regime was forced to grant Britain ‘most favoured nation’ status, giving it precedence over other foreign powers. The region around the Pearl River delta, now the location of Hong Kong, was ceded to British control. A Second Opium War began in 1856 after Britain tried levering the Qing into even more concessions, including the legalisation of opium. Again the Qing military suffered a humiliating defeat and the emperor was forced into a one-sided treaty. The Treaty of Tientsin (1860) removed the last significant barriers to foreign imperialism in China. The nation’s ports were thrown open to foreign ships. Opium use and importation were legalised. Restrictions on Christianity were removed and foreigners were permitted to travel freely around China. Foreign governments were permitted to establish legations (diplomatic compounds) in the imperial capital, Beijing – legations that were later attacked during the Boxer Rebellion (1900). With the doors to China thrown open, foreign diplomats, officials, traders and missionaries poured in through the second half of the 19th century. The more aggressive foreign imperialist powers – Britain, France, Germany, Russia and Japan – negotiated with regional officials and warlords to construct their own ‘spheres of influence’ within China. Foreign merchants and agents came to exert strong influence, if not control, over government and commerce in these regions. The growth of these ‘spheres of influence’ created a patchwork of foreign enclaves that functioned almost as virtual colonies within China’s borders. The Qing rulers retained their sovereignty and control of the national government, though in reality much of China was under foreign control. Many observers believed China would eventually disintegrate into several discrete colonies, each controlled by a foreign power. This idea was reflected in Western cartoons that depicted China as a gigantic pie or cake, carved up and devoured by European monarchs. Meanwhile, the Qing regime seemed utterly unable to prevent or resist this process. 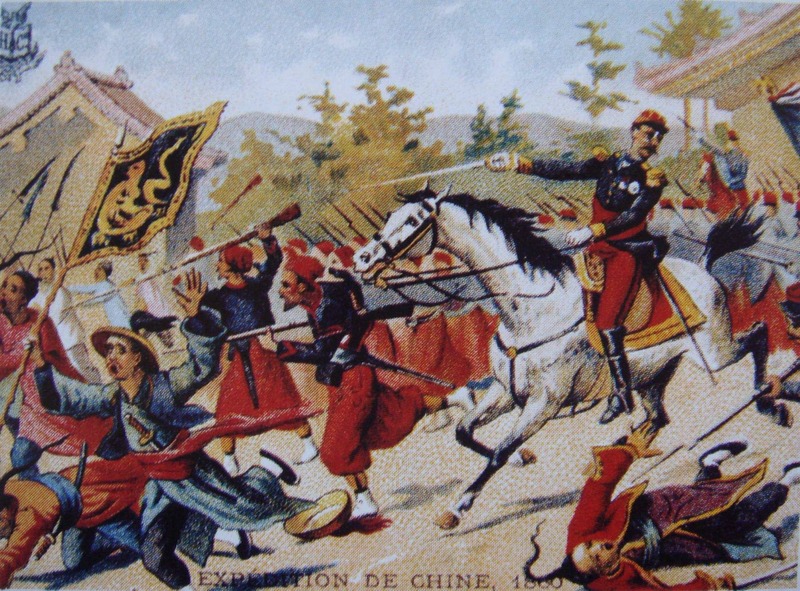 To make matters worse, in 1894 China again found itself at war, this time with Japan. 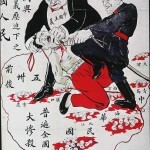 The First Sino-Japanese War, as it became known, began over disputed territorial control of the Korean peninsula. This war was another disaster for China. The Japanese had spent the previous quarter of a century embracing industrialism, modern production methods and Western approaches to military command and organisation. In contrast, the Qing had spent most of this period resisting modernisation. The Sino-Japanese War was enormously lopsided, lasting just eight months and ending with another crushing defeat. China was forced to cede Korea, the island of Taiwan and the Liaodong Peninsula to Japan. Control of Liaodong gave the Japanese a foothold in Manchuria, where they would stage an invasion of China during the 1930s. In 1899 yet another foreign power, the United States, entered the fray. Concerned that the European and Japanese carve-up of China threatened American commercial interests, US diplomats negotiated an ‘open door policy’ for American trade in China. These negotiations, however, were done with the other imperial powers in China – not with the Qing government. Beijing was informed rather than consulted, a measure of how impotent and irrelevant the Qing regime had become. As the 19th century came to an end, China found itself drug-addled, divided, exploited by foreign interests and plagued by corrupt officials. The Qing lacked the political will, national authority, popular support and military strength required to respond to these challenges. Many suffering Chinese believed the 350-year-old Qing dynasty had surrendered its power and lost its Mandate of Heaven, and that a change of government was imminent. They would not have long to wait. 1. The first significant contact between China and Europeans began in the 13th century, with visits by Marco Polo then Franciscan missionaries, followed by Jesuit missionaries in the 16th century. 2. Foreigners initially arrived in China as traders and missionaries. Foreign merchants operated mainly in the southern port of Macau, while missionaries travelled more broadly throughout China. 3. Qing rulers sought to limit foreign trade and contact through the canton system, which placed restrictions on who foreigners could deal with, however, these restrictions were largely unsuccessful. 4. 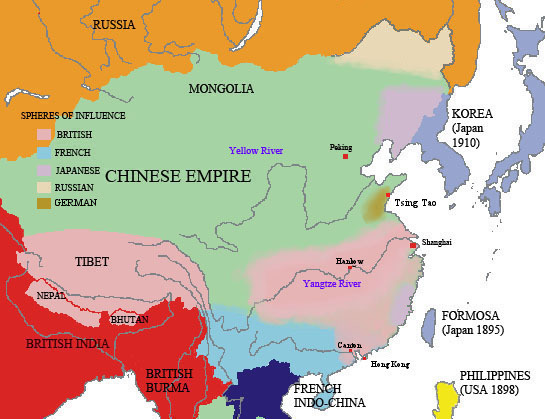 The British expended their presence and trade operations in China in the 19th century. They initiated the importation of opium and two wars with the Qing, which led to the opening of China to foreign powers. 5. 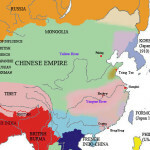 By the end of the 1800s, a number of foreign powers had moved into China and established spheres of influence to further their commercial and economic interests, leaving the Qing weakened and humiliated. G. Kucha & J. Llewellyn, “Foreign imperialism in China“, Alpha History, accessed [today’s date], https://alphahistory.com/chineserevolution/foreign-imperialism-in-china/.